40,000 lb capacity industrial telehandler with a 24" load center. This forklift has a compact lowered height of only 88" which makes it perfect for going in and out of a normal 8' dock door. This unit can lift 40,000 lbs (20 tons) to the height of 20'. All boom movements, including TRUE VERTICAL and TRUE HORIZONTAL REACH are controlled by a single joystick. This units tilt is auto-leveling with a manual override. Fine-feathering hydraulics ensure smooth and precise load positioning. Smooth hydrostatic drive is controlled by a comfortable foot treadle. 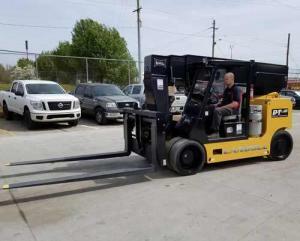 This forklift can climb a 24% grade with a 20 ton load with the help of the deep reduction planetary wheel hubs that generate 20,000 pounds of tractive effort. Radio remote control allows many of the jobs completed by the PT40 to only require one operator. This allows product placement to be precise viewing the work by any angle. 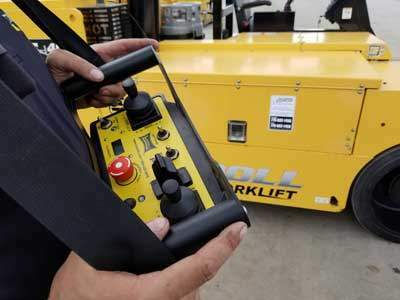 All PT40 Drive and lift functions can be controlled via a wireless transmitter, allowing a single operator to observe the entire work environment without being confined to the operator's seat. This allows safe loading of all products and allows for just one operator to be needed. When using the wireless remote always be aware of your surroundings and check each side of the lift for obstructions before use. With the help of the PT40's wireless remote you can be sure and place your product anywhere in your warehouse with precise control. With the jib attachment installed you have the ability to lift your product from the top giving you the versatility of a crane. 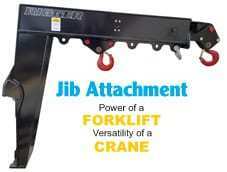 Great for lifting and setting tanks or anything that requires lifting from the top. Below is a list of 40,000 LB Capacity forklifts that we have available for rent. If you have any questions about renting any of our forklifts please call 770-692-1455 or email jt@accurateforklift.net. Our PT40 telehandler will go through a 8' dock door. With only a 88" height and 72" width the PT40 will easily get to where you need it.